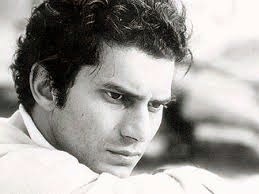 "Preghiera in gennaio" was written on the occasion of the suicide of Luigi Tenco, a friend and fellow singer/songwriter. Tenco took his life after his song "Ciao amore, ciao" was rejected at the 1967 Sanremo Music Festival, an annual competition for Italian songwriters. At the time, suicide being considered a sin by the Church, a traditional Catholic funeral mass and burial were prohibited. The song itself was influenced by "Prière pour aller au paradis avec les ânes," a poem by Francis Jammes with whom De Andrè probably became familiar by way of Georges Brassens. in the world of the good Lord." for those who fear it. whom you can and do want to save. that now sings in the wind. you will see, you will be pleased. decisi a regolare il loro amore sull'altare. durato tanti anni da chiamarlo ormai d'argento. 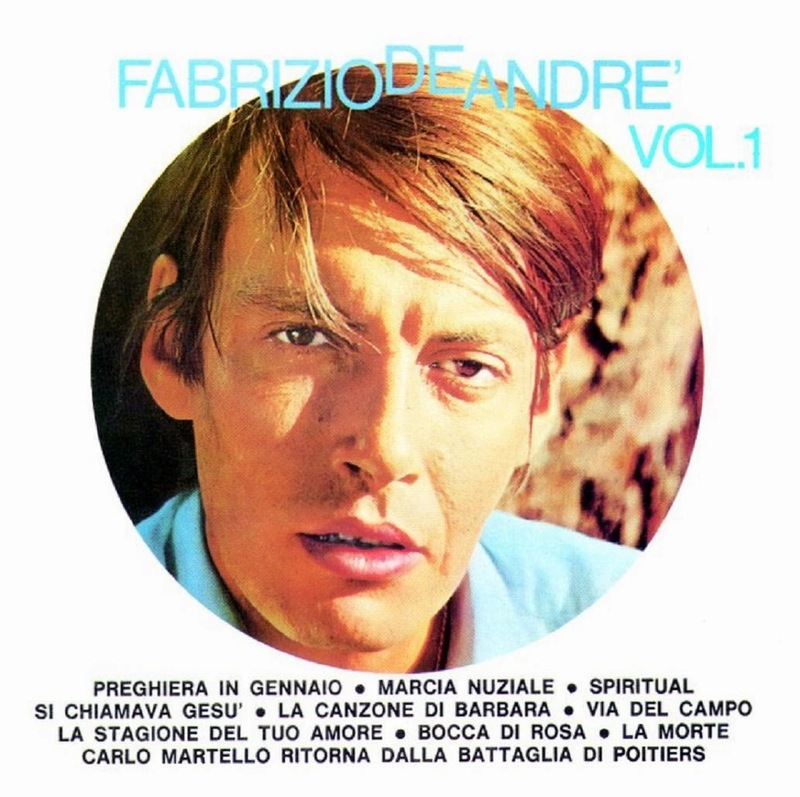 gridarono "per Giove, le nozze vanno avanti"
"Marcia nuziale" is De André's adaptation of "La marche nuptiale" by Georges Brassens, from his 1957 album Oncle Archibald. 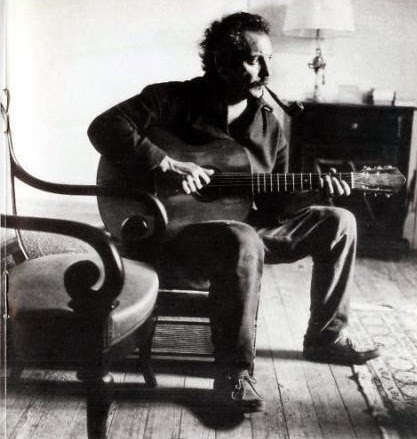 Georges Brassens was one of De André's earliest and strongest influences, offering inspiration both from his music and from his personal philosophical leanings - towards anarchism and against war and hypocrisy. determined to make their love official at the altar. of so many years you could call it by then one of silver. the gathered watched us, eyes nearly out of their heads. who had never seen marriages in that style. the hat my father was tormenting in one hand. determined to stop the wedding at any cost. she cradled her wildflowers like a child. played my harmonica like a church organ. Long live, long live the bride and the groom! nei campi di granturco mi troverai. scendi dalle stelle vienimi a cercare. ma un attimo di gioia me lo puoi regalare. come una mosca cieca che non sa più volare. scendi dalle stelle vienimi a salvare. noi qui sulla terra non lo abbiamo diviso. "Spiritual" was not a song that De André was enthusiastic about. He felt his voice was not well-suited for this type of song. It's possible that the idea with Volume I was to include in the same album various styles of music, ranging from a troubadour ballad like "Carlo Martello" to a traditional Afro-American song like this one. 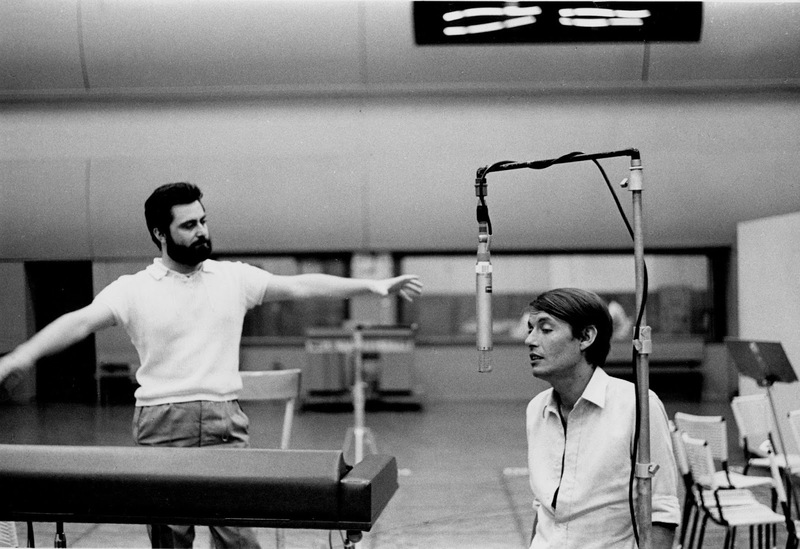 De André would probably not have included the song on the album, except it was needed to bring the duration of the album up to the minimum required at the time. amongst the other men you might search for me. in the fields of corn you might find me. come down from starry skies, come search for me. but a moment of joy you can give to me. like a blind fly that no longer knows how to fly. come down from starry skies, come save me. we here on earth have not shared it. you will find me amongst other men. in the fields of corn you will find me. in Heaven and on Earth I will search for you. chi lo uccide fra le braccia d'una croce. la preghiera l'insulto e lo sputo. ebbe un volto ed un nome: Gesù. sulla croce sbiancò come un giglio. 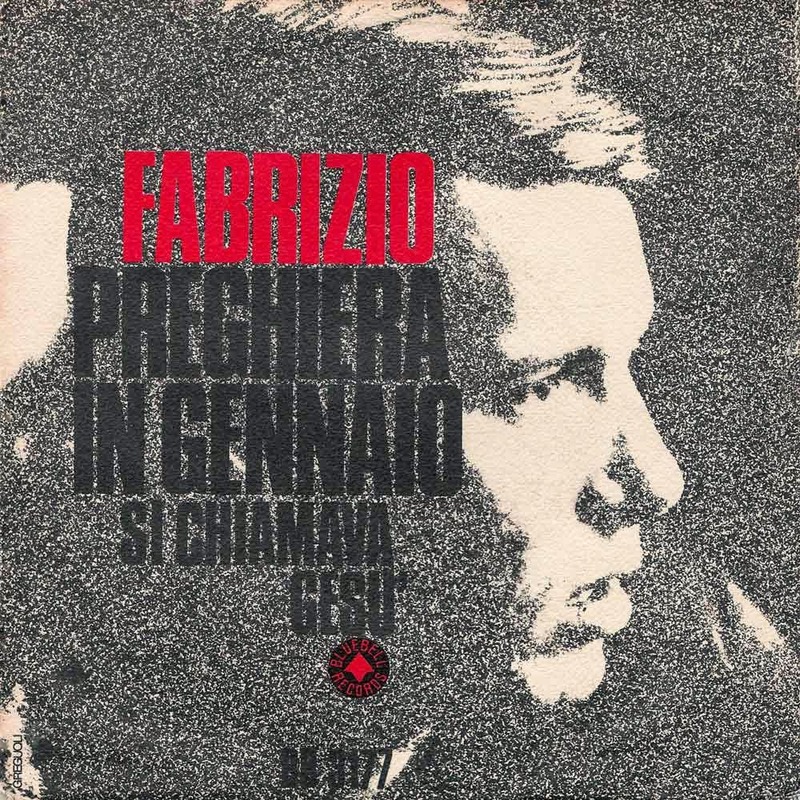 "Si chiamava Gesù" was another of De André's songs censored by Italian radio and television (RAI). Interestingly, the song was played on Vatican Radio; interesting because De André's anti-conformist concept of Christ was that he was not a deity, but rather a common man who, simply with the power of love, was able to rise above his own human-ness. To De André, Jesus as a common man was someone he could relate to and emulate, and whose teachings and example were thus far more powerful and immediate. because he took the earth by its hand. he went by the name of Jesus. like God passed into history. those who kill him in the arms of a cross. and who said to him, "Praise be to you always,"
the prayer, the insult and the sputum. because the evil from the land wasn't removed. he had a face and a name: Jesus. on the cross he turned white as a lily. 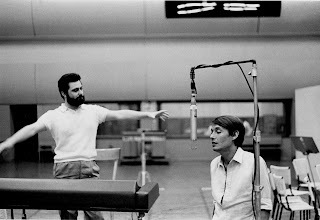 "La canzone di Barbara" was written perhaps with the thought of it being a follow-up to the very successful "La canzone di Marinella." But the song met with little success and was never included in De André's live performances. 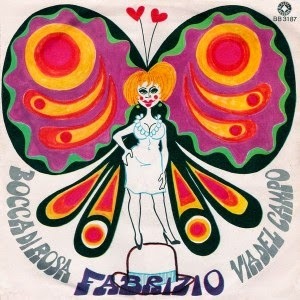 The song was dedicated to photographer Barbara Rombi Serra, who later took the cover photo for the second edition of La buona novella. is made of nettle and mimosa. for every love that is gone. "Via del Campo" is perhaps one of De André's best loved songs. 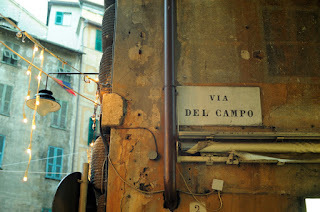 Via del Campo is one of the narrow alleys of the ancient center of Genoa, close to the port. With its mix of smugglers, thieves, prostitutes and many others living on the margins of society, in sharp contrast to the upper-middle class life De André was raised in, it represented to him a way of life more honest, real and intense. 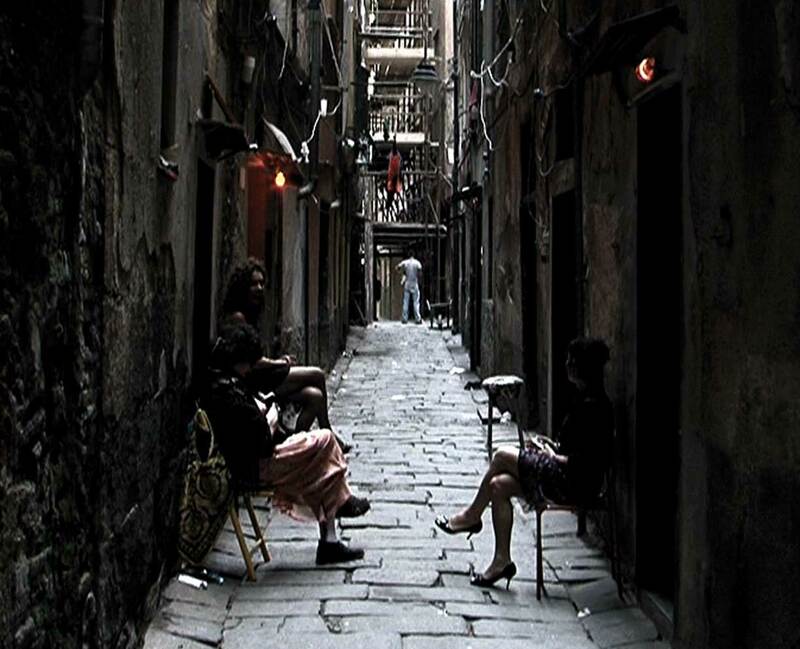 De André spent much time in this part of Genoa during his university years, and he lived there for a while. The song itself was inspired by a transvestite (commonly called "una graziosa") who plied his wares as a beautiful blonde named Josèphine. In 1972, photographer Lisetta Carmi published a book on the transvestites of Genova, I travestiti. The music for the song was first described as being from the 16th century. 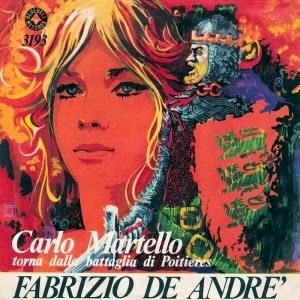 In fact the music, shown to De André by Enzo Jannacci, was a piece Jannacci had written and already used for one of his own songs, "La mia morosa la va alla fonte." As a joke, Jannacci had presented the song to De André as one with medieval origins. with great big leaf-colored eyes. selling to everyone the very same rose. flowers rise up where she walks. it’s enough to just take her by the hand. she looks at you with a smile. would be just up there on the second floor. until the balcony door is closed. cry hard if it doesn’t hear you. from manure, flowers arise . 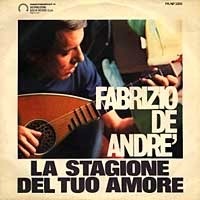 . .
"La stagione del tuo amore" did not appear on the first pressing of Volume I, as it was the replacement for "Caro amore" when permission for the use of the music was not obtained from Joaquìn Rodrigo. you have the sweetness of the evening. I’ll come to pick the snowflake. but you need not fear. but time is in no hurry. then revisit them in the light of an hour. se non può dare cattivo esempio. 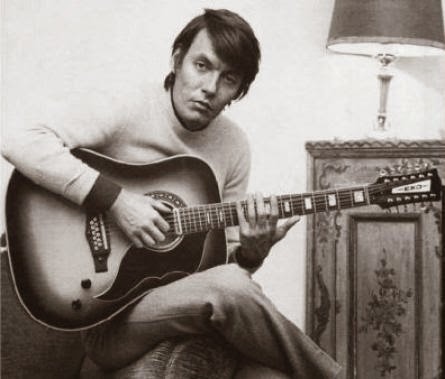 In addition to being one of the more famous of De André's songs, "Bocca di rosa" is the one he chose when asked in an interview which of his songs he most resembled. The term "bocca di rosa" is often used to mean prostitute; regarding this song, however, De André was outspoken that the woman of the song is not a prostitute. "La morte" uses the music of “Le verger du roi Louis,” released in 1960 by the French singer/songwriter Georges Brassens, setting to music a 19th century poem by Théodore de Banville. The poem alludes to the "gardens of King Louis" - the parts of his forest that were reserved for those who were hanged, in "clusters never visited." De André feared death, something he spoke about on several occasions, and death is a presence in many of his songs. The opening lines of De André's lyric are quite similar to the first lines of Cesare Pavesi's 1950 poem "Death Will Come and Have Your Eyes." it will have your lips and your eyes. it will come, giving you no warning. sounding neither horn nor drum. it will have your breast and your arms. you cried at the door right hard. will bear poorly his death. because Death was for you a friend. and among the enemies, bereavement and weeping. neither courage nor struggle is worthwhile. in battaglia può correre il rischio di perder la chiave"
ad altra più facile fonte la sete calmate"
"Se voi non foste il mio sovrano"
ma poiché siete il mio signore"
"debbo concedermi spoglia ad ogni pudore"
è un prezzo di favor"
v'eran tariffe inferiori alle tremila lire"
This song was released in 1963 as the B side of a 45 with "Il fannullone" as the A-side. The text was written by a friend from childhood, Paolo Villagio, and the music is by De André. 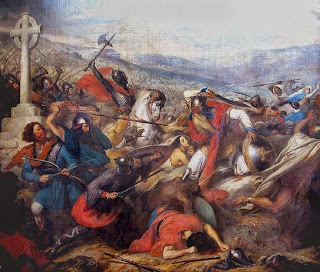 The Battle of Poitiers occurred in 732, a battle between the Franks and the Moors in what is now northern France. The song is in the style of popular French pastourelles sung by medieval troubadours about encounters between knights and country girls. In 1965 a complaint was brought against De André and his label Karim for obscene content in the lyrics. The case was settled in De André's favor in 1968. The Italian in this song is an old style, and Riccardo Venturi has done a nice translation into a similarly "olde" style of English. King Charles was returning from the war. crowning him with a laurel. it allows you not a moment to pursue love. Thus complains the Christian king. the victor of the Moors. said King Charles, dismounting quickly from his saddle. that which you seek is already the joy of another. But greater than honor was the power of abstinence. but it was her majesty. “I wouldn’t conceal the desire to run far away." was covered again with honor. Quickly the maiden harpooned him. she presents to her Lord. should all end up with big whores. "Even the price, then, can be criticized. King Charles returned from the war.